The Benedictine Convent of St. John at Müstair is an ancient monastery with an exceptionally well-preserved heritage of Carolingian art. The murals depicting scenes from the Old and New Testament date from around 800 A.D., and were uncovered during 20th century restoration works. Along with it were some Romanesque frescoes from the 1160s. It is believed that the abbey was established ca. 780 by a bishop of Chur. The abbey was located along the Val Müstair pass over the Alps from Italy and was fortified to allow it to control the pass. It was converted into a nunnery in the 1160s. Today there still is a resident community of about twelve nuns. A day trip to Müstair is absolutely recommended to anyone staying in the center or south east of Switzerland. The drive out there, across the Flüela Pass and through the Swiss National Park, is very scenic. I just had to stop my rental car a couple of times to take pictures of the natural surroundings. There are several picturesque villages too, and hiking paths. I combined the visit of this WHS with one to the Albula Railway on the same day – in hindsight it would have been better to divide this over 2 days, so to enjoy both sites more. The Convent is easy to find in Müstair: it’s the prominent building complex at the far end of town, white and light grey in colour. In the morning it’s only open between 10 and 12. There were quite a lot of visitors already present when I arrived at 10.45. Numerous Italians among them, as this is close to the border with Italy. I was a bit confused where to start my tour – I had read the reviews below and did not want to end up at the museum/convent while the church is the most impressive part. However, there’s another sight directly at the entrance: the double chapel, housed in a small white building. This also has mural paintings from the Carolingian and romanesque periods. The interior is being renovated at the moment, and it can take years for it to be finished. While a guided tour was being conducted, I was able to peek in and became interested. So after paying up I could join the remaining part of the informative session about restoration and the several mural layers that have been found. Another highlight of the chapel is the original wooden ceiling. After the tour finished, there were maybe 20 minutes left before the convent would close for lunch. I was somewhat in doubt about what I had just seen: was this the main part of the church, or “just” the chapel. The answer became clear immediately when I walked into the main building – the church is what the chapel could look like in years. Here the murals almost fully cover the walls. Most of them are in very good repair, with bright colours (these are the romanesque paintings I guess). The church interior is quite small and very atmospheric. 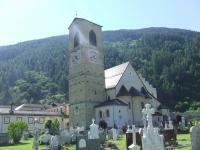 Tucked away in a rather remote valley in the Swiss Alps just next to the Italian border you find the Convent of St John. Founded in Carolingian times on a major trade route across the Alps it still serves as a nunnery to this day. 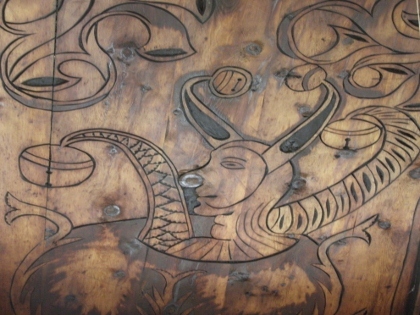 It's primary draw are the colorful Carolingian and Romanesque murals. At the time of my visit (Summer 2018) both the main altar as well as the next door chapel were under renovation. The site itself isn't large and with plenty of it covered in scaffolds I wasn't able to fully appreciate it. And as fascinating as I find all things Carolingian I have to admit that most of the Carolingian sites (including Müstäir) are rather simple and small in scope. The single exception is Aachen Cathedral which is in a league of its own when it comes to Carolingian sites. Visiting the abbey is free. There is an attached museum which charges entry, but it's a rather simple offering, so you may want to skip it. There are also regular tours. But I would have had to wait at least an hour and decided against joining. One practical hint: The abbey is really dark on the inside. I had a hard time making out all the murals solely relying on natural light. There are light switches, though, when you enter that will illuminate the murals. It's a close to 4h trip from Zürich to the abbey. You have to change trains twice and then hop on a bus in Zernez. The last stretch by bus takes you through the sole Swiss National Park, aptly named Swiss National Park. Travelling in Switzerland, you can rest assured that you will catch your connection as trains and busses run on time. The next Swiss world heritage site is the Rhaetian Railways site. Return to Zernez by bus and take the train to Samaden. Samaden itself is already part of the Rhaetian Railways. I combined both sites into a single day. On the Italian side you can continue to Merano/Bozen and get to the Dolomites. If you enjoy Swiss alpine resorts, both Davos and St. Moritz are within reach. I visited this WHS in May 2014. It's just a few minutes from the border with Italy. The museum and church are open till 17:00. I enjoyed the well preserved frescoes in the church but the highlight of my visit was walking in the cemetery near the church enjoying some peace and quiet while taking in the surrounding mountain scenery. Müstair is a small village in the Romansh-speaking part of Switzerland, just 1 km from the Italian border. The main (well, only) attraction is the impressive Convent of St. John, which consists of a small church and the main building, which is still an active monastery with a handful of nuns. The church itself can be visited free of charge. Only the convent itself, which includes a reasonably interesting exhibition, charges for admission. The medieval frescoes are very big and really beautiful, and certainly merit its inclusion on the WH list, since there are very few remains from this period, and even fewer in such a good condition. The historic value and scenic setting in a beautiful mountain landscape make this a worthwhile trip, even though Müstair is a bit out of the way. It can actually be quite easily reached by public transport from Zernez in Switzerland (passing through the scenic Swiss National Park) and from Mals in Italy (and from there over the Reschen Pass to Austria). The highlight of this WHS is the brightly coloured expanse of frescoes inside the church. But almost as interesting was a visit to nearby Mustair village, located deep in the Romansch-speaking region of Switzerland. I reached Mustair by postbus from Zernez station, passing through the scenic Swiss National Park en route. The bus continues from Mustair to Malles station (Italy), another point of access. Above, David Berlanda has written an excellent overview of this marvelous site. I went in Feb. 2008 by Swiss rail to Scoul where I stayed overnight at the excellent hostel next to the train station followed the next day by post bus to the Val Mustair. While I had only a few hours at St. John's Convent it remains one of my most treasured memories for the beautiful sweep and tranquility of the valley and the perfection, beauty and clarity of the frescoes in this intimate church. The religious architecture and art mesh in a pleasingly direct manner. There is a smaller chapel in front of the church where there may be more frescoes yet to be uncovered as I was told by a photographer working with an infrared camera. I was told that the Benedictine hours have been continuously kept for over 1000 years first by monks, now by nuns and that the present order has invited younger sisters from the Philippines to join them. Some distance above the convent I've been told there is a lake possibly to hike to. I have Brother Antoine Galliker (deceased Jan. 2010)of the Abbaye de Fontaine-Andre in Neuchatel for encouraging me to visit The Convent of St. John at Mustair. 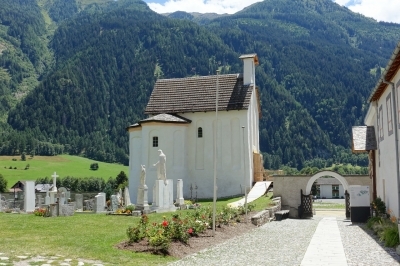 I have been once to the female Benedictine convent in Müstair, situated in a small village in a valley of the Canton of the Grisons. It was found by the bishop of Chur at the behest of Charlemagne in the 9th century and it’s a beautiful example of the Christian monastic renovation of that period. It has two courts and it’s closed by walls. The Carolingian church, in part reconstructed in Gothic and Baroque styles, has a high tower, that was the house of the abbess. Inside were discovered, with the removal of the Gothic ceiling and of the whithewash, the greatest complex of frescoes, Carolingian and Romanesque, in Switzerland (with scenes from the Old and the New Testament painted with ochre, red, and brown colours),a statue of Charlemagne, a nice relief, an interesting altar, a women's gallery and three arcaded apsis. Near the church are the chapels of St. Ulrich and Nicolas, with Carolingian relieves, and of Holy Cross. There are also the rooms of the convent with original furniture, frescos and stucco (like in the residence of the bishop Norbert). I was a little bit disappointed by the conventual buildings, but I liked very much the frescos inside. It justifies the inscription because it contains the most important Swiss frescos, that are also between the most important Carolingian frescos. The buildings are in a very good state of conservation and also the frescos. 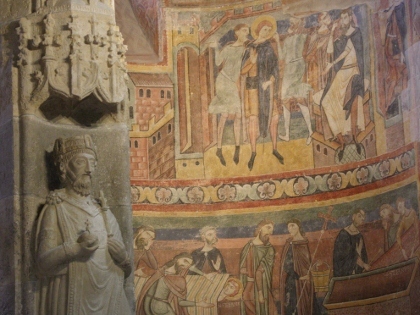 However there are some parts of the Carolingian frescos in the church that aren't conservated well because of their antiquity or because the fact that they are covered by the Romanesque frescos and some aren't there because they are in the convent museum or in the Regional Museum in Zürich. I think that the frescos which are in Swiss museums can be put in place again. If you consider the 9th century buildings, which constitue the reason why the convent is on the WHL, you can't say that the convent as a whole has much authenticity, because only the church and not much more is of this period. But if you consider all the Middle Ages, the convent has a very high authenticity. 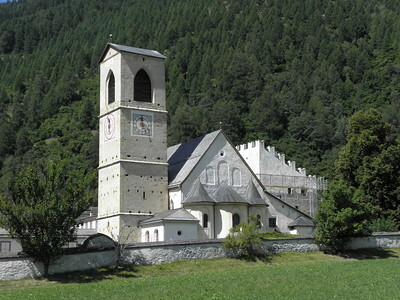 The convent is worth to be visited if you are in the Canton of Grisons, but is not easy to reach it. Müstair is on the road 28 and there are some roads going there from Sankt Moritz, Davos or Zernez but also from Italy (from Bormio in the Valtellina Valley and Livigno or from Malles Venosta or Sluderno in the Venosta Valley) and from Austria (from Nauders). The parking is in front of the convent. The entrance in the church is free, even if when you see the ticket office you can think that the tickets are for the church and buy them for iy, while they are for the convent (where you enter from a door, situated in the church, of which you must ring the bell). 100 Community Members have visited.